If you look really hard, it’s actually very easy to find discounts and promotions. Lately, there are many websites that promotes discounts. Website such as Groupon.com.my and LivingSocial.com offers discount for a limited time. You don’t need to open the website everyday. All you need to do is to subscribe to their mailing list and they will email all the necessary information. However, you must be careful not to be tempted to buy anything on offer. It can burn your pocket. Anyway, if you are planning to visit Melaka anytime soon, there are two discount coupons that you can utilize between now till June 2013. Do take note that you still have about 3 days to take up the offer (post published 26/01/2013). 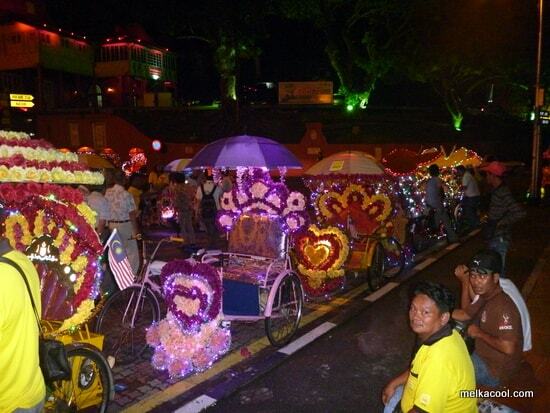 Experience Melaka from a trishaw. This coupon entitle you to a 1-hour trishaw ride touring the historical city of Melaka for up to 2 people. You will depart from Melaka Duck Tour Ticket Counter at Mat Kimi Trishaw Services Counter and you wil pass by these places – Melaka tree / Ancient Craft, Melaka Stamp Museum, Boston House, A Famosa, St. Paul Hill, Melaka Sultanate Palace Museum, Memorial of Independence Day, Sound & Light Theatre, Stadthuys, Melaka River Cruise, Replica Of Portuguese Ship, Medan Samudera Museum and back to Melaka Duck Tour. Children aged six and below ride for free. Details at Groupon. You can see the Cowboy town firework display here, which we visited in Dec 2012. Please make sure you check the terms and conditions of the discount coupons. If you are looking for a place to stay, check out Homestay Kesidang or the hotels featured at our Melaka Hotels section.